Well I do not know how I happen to check this new cool Google Application, It is called Google Insights for Search. The site will give you information about the history of searches in your country and or places that you like. 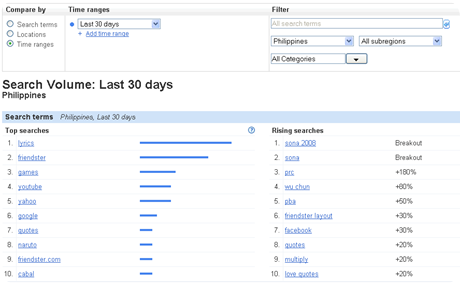 The data says that for the last 30 days, there where rising search for SONA 2008 keywords and PRC this might be because of the just concluded President’s SONA and Nursing Board Exam results. You can check out the Google Insights for Search application here I might say that this is very good application for those keyword hunters like me. Now It will help us earn more money from Blogging. Knowing the right keywords means earning Good in CPC. Thank you for sharing this. 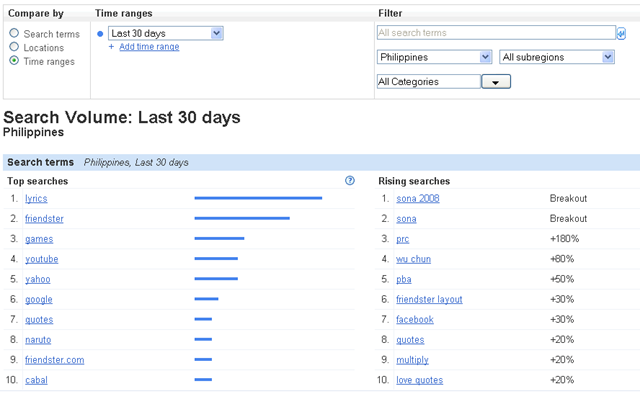 Amazed to see that lyrics and Friendster rules in searches this past 30 days. I hope the category search will work in the future. It only means that Filipinos really love lyrics and lots of younger generation likes friendster..